It took more than six decades, but Tuskegee Airman Sherman W. White Jr. was finally honored Monday on a day when Americans paid tribute to their war dead. Overcast, rainy skies failed to hold down the crowd outside a house at 690 W. Jeff Davis Ave. as speakers praised a young man who paid the supreme sacrifice in defense of his country. A plaque, unveiled near the sidewalk where White and his family lived during World War II, mentioned their patriotism and sacrifices at home and aboard in the name of national defense. While died July 2, 1943, when his P-40 fighter was shot down by German planes over Sicily as he and other Tuskegee Airmen escorted U.S. bombers to enemy installations. A second member of White’s unit also died when his plane was shot down. “Despite what you might see and feel, the sun is shining today,” said Montgomery historian Richard Bailey. Bailey mentioned several prominent black families and individuals who have lived on West Jeff Davis Avenue. He said the White marker “will add more than just a footnote to Montgomery history.” The crowd was large and appreciative as speakers lauded White. Veterans of several wars were on hand to honor his memory. “It is right today that we honor (White) and all of the brave,” said retired Army Maj. Gen. Will Hill Tankersley, an infantry officer who saw combat during the Korean War. The plaque cost about $1,700 and was paid for by the Montgomery Area Chamber of Commerce Historical Preservation and Promotion Foundation, said Chamber spokeswoman Patsy Guy, who attended the event. The ceremony followed efforts by local historians who have been trying to draw attention to White and his brief but heroic service during World War II. White graduated in the third Tuskegee Airmen class in May 1942 and was the first Montgomery native to complete basic training with a unit that would blaze a trail of glory across the skies of north Africa, Sicily and Germany. He and another Tuskegee Airman, James McCullin, were believed to have been among the first black pilots killed during the war. Montgomery historian Wesley Newton wrote an article about White and his family in Alabama Heritage magazine two years ago. 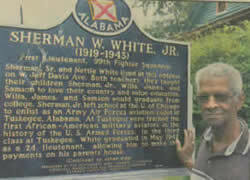 That launched efforts to honor White in his hometown. “Today is (as) if a bugler were playing taps for 1st Lt. Sherman White Jr., 99th Fighter Squadron, United States Army Air Forces,” Newton said. Most of White’s relatives died years ago, but a cousin, Samson White, was on hand for the unveiling Monday morning. It began to rain as the program began, but no one seemed to mind. They just opened their umbrellas and listened to glowing accounts of the young pilot who had given his life for his country. say a few words. Although Woods did not know White praised him for his contribution to the war effort.